Google’s long expected second shot at taking on Facebook in the social networking space has arrived in the form of the Google+ Project. It has some interesting twists on the social networking model but is far from a Facebook-killer. The terrible name is a bad start. Google+? Google+! I can’t even question or exclaim about the bad name without it looking bad in writing. Pronounced “Google Plus,” the product is officially written as Google+ — making placing any punctuation after the name fairly awkward. Seriously, I’m cursing whoever made the final decision to go with Google+ as a name. Wasn’t the Google +1 sharing service bad enough? Now we have Google+, which in turn allows you to +1 things that you’ve Google+’d. My head hurts from writing that. In this article, I’ll generally stick with the Google+ name except where Google Plus is more legible, due to punctuation. What about the product itself? Google dubs Google+ as a “project” rather than a product, stressing it’s part of making Google itself more social rather than being a standalone social network to take on Facebook. “It’s ‘Plus’ because it takes products from Google and makes them better and ‘project’ because it’s an ongoing set of products,” said Vic Gundotra, the senior vice president who oversees Google’s social products. OK, but as the saying goes, if it looks like a duck and quacks like a duck, it’s probably a duck. And Google+ looks like and quacks like Facebook in several ways. Most important, Google+ is a social network of your friends, family and other contacts, a way to connect to these people, just like Facebook. The idea is that you can easily drag-and-drop people into different types of Circles, which you can then use for sharing different types of things. For example, you can create a “Family” circle where you might chose to share things only with family members in it, while another “Work” circle might contain work colleagues who only see what you share to that. While Facebook might not have been built from the beginning with a Circles-like sharing concept, Facebook does currently have two features that are similar: Friend Lists & Groups. Added in December 2007, Friend Lists allow you to share some of your Facebook information with specific groups of friends (or other selected contacts) that you create. They’re also supposed to allow you to group message people in a list, though I couldn’t get this to work, when I tested it today. Friend Lists don’t allow for selective sharing. But the updated Facebook Groups feature thatcame out last October does provide this, a way to share what you want with whom you want. How does Circles weight up against these? I can’t say first hand. The Google+ product wasn’t live for me to test when I wrote this (our hands-on review will come later today). But that list can’t be used, as best I can tell, to start an associated group to share just to these people. Instead, when I tested today, I was still forced to make a group, then pick people individually to add to that. So, the drag-and-drop interface of Circles looks appealing. Then again, if you have hundreds of “friends,” it still might turn into too much organization. Maybe people will use it to create some select groups that they really want (family, close friends, those in a club, etc.). But if it turns into a wonderful tool, it’s hard to imagine that Facebook couldn’t easily match it. There’s no limit to the number of circles you can create. But where do the people come from who will be in your circles? First, any contacts you’ve stored through the Google Contacts service will be available. If you have no contacts, you can import them through the CSV format, which many contact services will export out to. Google also said that it is looking into ways to directly important contacts from Yahoo and Microsoft. Facebook wasn’t mentioned. That’s not surprising. Facebook hasn’t allowed the export of friends’ email addresses, except to … Yahoo and Microsoft. What’s all this mean in practical terms? Everyone in Google+ will effectively be starting from scratch. If you already use things like Gmail, you probably have Google Contacts that give you email addresses of your social network. If you don’t, you can import — and Yahoo and Microsoft may serve as go-betweens to help you bring information from Facebook into Google Plus. The bigger issue is that your contacts — be that from within Google or imported from Facebook — are basically just email addresses. The won’t have any social connection information with them. Google Contacts won’t know that a particular person whose email address you have is friends with other people you know. A Facebook import won’t turn email addresses gathered from there into links with other people who use Facebook. Instead, what will really jump start Google+ is if a significant number of people come into the system and start claiming profiles within it, effectively turning those email addresses into virtual people who have connections within Google Plus. That’s a big if. If you’re already happy using Facebook, you may have no more incentive to use Google’s new social network than someone already happy using Google has to switch over to Bing. What you’re using is doing the job just fine. When people do get into the system, that does open up another way to add contacts. You’ll be able to search through other members who have registered. But here’s the crazy thing. Those connections you may have already formed using Google Buzz? Remember, Google’s last attempt to take on Facebook from February 2010? None of that is being used for Google Plus. The two products are being kept completely separate. I suspect Google’s trying to be as cautious as possible, in the wake of its settlement with the US Federal Trade Commission (see Google Settles FTC Charges Over Buzz, Agrees To 20 Years Of Privacy Audits). Buzz seems tainted, so keeping Google+ isolated from that may be deemed the most prudent course. The short answer is it won’t have any major impact on Buzz at launch. Buzz users will still see a Buzz tab on their Google profile, and Buzz will continue working as it always has. Google+ users can also be Buzz users or can decide to just share their content using one of the products. Over time, we’ll determine what makes the most sense in terms of integrating the products. Now let’s talk about how you see what’s being shared by those in your network, as well as what you can specifically share. In the new black navigation bar that began showing up for some people this week, there’s a “Share” area to the right side. That bar, by the way, has been dubbed the “One Google” bar, Google told me. 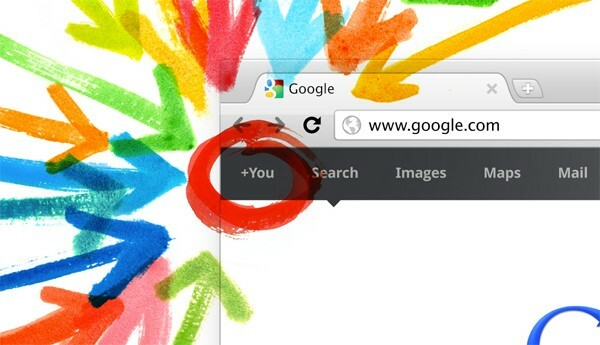 No matter where you are on Google, you’ll have the ability to share something out to Google Plus. In the Stream itself, there’s a longer box, where you can enter a status update or use icons to upload and share photo and videos. You can also share links or your location, if you’ve allowed Google to track that for you. On mobile devices, you can select from a drop-down of nearby places to check-in. The check-in feature also raises questions about Google Latitude — does it get absorbed into Google+ eventually? What about HotPot? In this screenshot, the person is viewing what’s been shared only by people in their “Bike Geeks” groups, as highlighted on the left side. By selecting another circle that’s listed, they would see only information being shared by that group. As with Twitter (or with Facebook, when it comes to fan pages), it’s possible with Google+ to follow other people on the network, even if they don’t reciprocate and follow you or friend you back. Google says that if you follow someone this way, you’ll only see what they choose to share with everyone publicly. If they share some things more restrictively, with particular circles, for example, those outside of those circles won’t see that. Somewhat related, you can be friends with people who aren’t formally part of Google Plus. If they’re an email-only contact and never formally join the service, you can still add them to circles and share with them. When you do this, they’ll apparently be sent an email with whatever you wanted to share, a picture, an update and so on. The downside is that if they’re not on Google Plus, they’ll get a notification anytime you share anything. So if you’re a big sharer, potentially you might hit some of your friends with a lot of email. In the stream example above, there was a +1 button at the bottom of the photo. Yes, anything you like within Google+ can be +1′d, in the way that anything you like on Facebook can be liked with Facebook Like buttons. Further more, all those Google +1 buttons that are now starting to appear on Google search worldwide? Those Google +1 buttons that publishers have diligently been adding to their sites since they were released earlier this month? Nothing from those button clicks flows back into Google Plus. It’s crazy. It makes no sense. It’s as if Facebook launched its Like buttons but forgot to hook them up to flow information back into Facebook. Right now, it remains the case that if you want to see what someone has +1′d, then you have to remember to go to their Google Profile page on a regular basis, then hope they’ve enabled the +1 tab on that profile, then rinse and repeat for other people. Google told me that it would be “logical” to see +1 flow into Google+ and that “one could guess eventually” it will happen. So, I’m pretty sure we will see this happen. But when it will launch is unclear, and it really feels like an incredible mistake that it’s not part of the launch. Time for more features. What if you started a social network and no one knew what to share? That’s a problem that Google Sparks is intended to solve. The relevancy is supposed to be tweaked to find especially sharable content that people are already clicking on, things that are very visual with photo and pictures. I got a brief demo trying two searches, and the results didn’t thrill me. They were OK, but they didn’t feel particularly shareable. Still, the feature will probably be useful to some, and I can’t really assess the relevancy either way on such limited testing. Google seems to be hanging most of its hopes that Google+ will attract people from Facebook on two main features, I’d say. One is the aforementioned Circles sharing feature. The other is the Hangout video chat feature. The demo I saw of the system was compelling. As one participant spoke, the main image automatically changed to that person. You can also play video that everyone watches. Gundotra spent some time talking with me about how Google has examined the social dynamics of video chat, to get people more comfortable participating. The key is to get several people all involved casually, rather than to barge in with a solitary invite. He used a “talking to your neighbor” analogy to explain more. You’re probably are hesitant to knock a neighbor’s door and disturb them just because you want to talk. But if you saw them outside on their porch, Gundotra said, you’d probably feel better saying “Hi” when passing by. If two neighbors were sitting and talking, you’d probably feel rude not also stopping and chatting. Hence the Hangouts name. When someone launches a Hangout, this shows up on the feed that goes out to their friends. As more people join, the notifications get updated to show the number participating. As that number rises, Google says even more people are compelled to take part. The party ends at 10, however. No more can participate for scale reasons and also because the group dynamics get too hard, Gundotra said. If someone leaves, others can come in. The puzzling thing to me is that Google’s not made it possible for anyone to stream the chat out to non-participants. If you have a group of friends, and not all can take part at once, others might be interested just to listen in. Beyond that, Hangouts seems like a pretty awesome tool for those who wanted to record video shows. But there’s no way to save what happens. Huddle is for Android 2.0+ phones, iPhone 4.0+ phones and SMS, Google tells me. For those with Android phones, you can have any picture you take be uploaded to a centralized — and private — photo album area. Google tells me they hope to bring it to other phones, as well. Want to try the service? Right now, it’s strictly invite only. Some press are being allowed in, along with others that Google hand picks. There’s no ETA on when wider invites will be available. Unusually, this isn’t being called a beta test or an experiment but rather a “field trial” that’s meant to finally gather some feedback from outside Google itself. The limited test is probably wise. It’ll give Google more time to discover things it might not have anticipated being problems, as was the case with Buzz. As for a wider release, and possible success, it’s anyone’s guess. As I said earlier, if you’re happy using Facebook, there seems relatively little to make you want to switch over to Google Plus, at the moment. Perhaps with further Google +1 integration, that might change. Perhaps if there are people who want a Facebook alternative, Google’s now got a core to build on for them. At least the guessing about what Google might be doing is over.